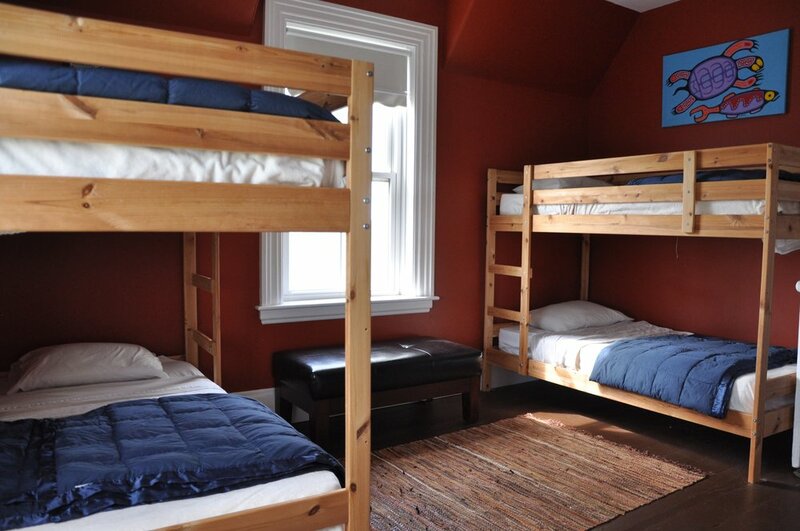 Our bunk room is spacious and a great choice for family, friends, or any group. Comfortable beds, sheets and pillows in each bunk with fresh towels for everyone. A private unattached is just a short distance away. The room is well lit and displays some beautiful Canadian Art pieces. Beautiful fresh cut flowers from the property await your arrival. Beyond your room, the house boasts multiple sitting rooms. Just across the hall is a common room with games, books, a tv (no cable) but great selection of films. There is also a beautiful landing just outside your door with a cozy corner and beautiful afternoon sunlight. Upon entry into the house there is a spacious sun porch with tables and chairs for any use. Outside there are beautiful herb, flower and vegetable gardens, along with multiple seating areas, lounge chairs and a covered deck. We are also situated on a 13 acre property with rustic walking trails ("paved" by the local deer), a babbling brook, two ponds and the song of a plethora of birds to make your heart sing. "Kelly & Danny have been great hosts. They were very nice and fast in replying before our arrival. Food was great, we would highly recommend to go there. The house is beatifully decorated and very cosy. Even their dog (who lives in the backyard) gave us a warm welcome. In case we`ll be in that area again, we will definitely stay there again." “These guys, what a duo! We couldn't have been more happy to overnight with Kelly and Danny in Maitland during our ten day holiday in Nova Scotia. These guys have carved out a fresh, special presence in the area that stands apart from much else around it; their b&b invites open minded, creative travelers a space to tend to their basic needs (like eating and sleeping), but also visit and connect with their hosts and other guests in ideas and conversations. These guys value the exchange between people in thought and feeling, and you experience this around the energy of their breakfast table, as well as in the like-mindedness of guests they seem to attract. Their accommodations are clean, comfortable, and full of charm, even the bunk bed room we had fun sharing.